Yasujirō Ozu's 1953 drama tells the story of an aging couple who travel to Tokyo to visit their grown children. It is widely regarded as Ozu's masterpiece and is often cited as one of the greatest films ever made. The film can be streamed commercial-free by Hulu Plus subscribers here, and it is also available to rent on iTunes and on Amazon Instant Video. Part of the Criterion On Hulu FanFare club. I signed up for Hulu last month specifically because they had the Criterion Collection movies. 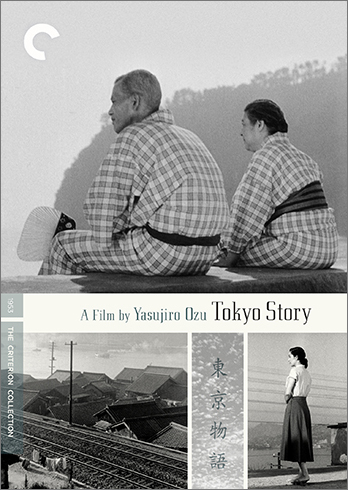 Since Tokyo Story consistently ranks among the best movies ever made, it was the very first one I watched. It's not hard to see why it's so beloved. It's an interesting slice-of-life from post-war Japan, not even a decade after the end of the war. Big changes have already taken place though. The occupation is over. Tokyo is "the big city" again, attracting people from all over the country. A real economy has started to pick up. The very first thing I noticed about this movie is the unusual technique of having the actors sometimes perform directly to camera, directly to the point of view of one character or another. No "over-over-two-shots" or looking out of frame when delivering dialog. Now that I've seen more Ozu movies, I understand that this is somewhat of a signature of his. I discussed this with a friend who said he feels like it's reminiscent of the tsunare in kabuki. I'm not sure I agree, as the characterization in Ozu's movies isn't flamboyant nor are the characters or actors addressing the audience. In any case, I take his point that it is perhaps not unusual for a Japanese audience to feel addressed directly. For Hollywood audiences, much more used to the shot-reverse-shot, it's startling at first, but you soon come to like it. I do imagine it's much more difficult for the actors, since they have no scene partner but the camera to play off of. Another thing that stands out is the background action. In many of the Tokyo scenes where there's an open window or doorway in the shot, you can see people in other houses just living their lives. Folding clothes, washing, smoking, etc. The way the Hirayama children treat their parents is heartbreaking. After the father, Shukichi, meets up with some old friends from the village and they wind up drunk in a bar, the pain in their voices when they talk of their children lost in the war is very poignant. 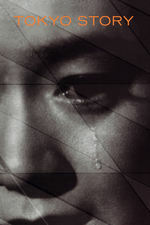 Agonizing, really. Then there is the other kind of pain, caused by their children who live, but are instead disappointments of one sort or another. That's even worse. Meanwhile the mother, Tomi, and her son's widow, Noriko, played by Setsuko Hara, are also having a heart-to-heart. Tomi says Noriko is the only one who really cares for her and Shukichi. She tells Noriko that she's a good woman, that it's been long enough, and she should remarry. The performances in this scene are just stellar. Though it can be a little hard on we among The Unmothered. The one scene that really felt full of meaning to me was the Hirayama children, Koichi and Shige, discussing what a bother it will be to go see their critically ill mother. Meanwhile, in the background you can hear rivets being pounded by a pneumatic hammer. Then Ozu cuts to scenes of new iron construction going up. It's as if he was saying that the new Tokyo — very western and made of iron — is eventually going to replace all of old Japan and that may not be entirely for the best. Especially if it alienates families from one another. P.S. God willing, Setsuko Hara's 95th birthday will be next week. This Guardian article from her birthday in 2010, “The heart-wrenching performance of Setsuko Hara, Ozu's quiet muse,” by Peter Bradshaw talks about her extremely fruitful collaboration with Ozu. It's well worth reading if, like me, you're curious about her. I wasn't familiar with Ozu's oeuvre, nor any of the other movies Hara graced during her all to brief career, so I hadn't fallen in love with her yet when I first screened Tokyo Story. Now I look forward to a movie that has her in it, whether by Ozu or anyone else. I'm really excited to discuss this but fell asleep half way through watching last night (comment on my day not on the film), so I'll pitch in to this discussion tonight after I finish it! Robert Graves said that "the remarkable thing about Shakespeare is that he is really very good - in spite of all the people who say he is very good," and I feel the same way about this film. When it ended last night, my first thought was just that, in spite of all its accolades, it might actually be the greatest film ever made. Not necessarily my favorite film (though I absolutely loved it) or even the best film ever made (though surely in the top nanometer sliver), but the greatest. I hope you understand what I mean because I’m not sure if I can articulate it any better than that. The depth of feeling, the fully fleshed out character relationships, the all-encompassing empathy, the surprising emotional turns…it all adds up to a film that feels mature in a way that few other films, especially of its time period, do. Think about how easy it would be to get it all wrong: in a lesser film the children would be selfish caricatures constantly neglecting their saintly parents, and when the mother passes away the kids get their comeuppance in the form of realizing too late how they had mistreated her. That’s what I was expecting this to be (even up until the last half hour), but what I got instead was something much more subtle and remarkable and substantial. I suppose if I were writing a critical essay I’d say that one of the themes of the film was "absolution," but since this is a FanFare thread I’ll just say that I loved how the message of the film, in the end, is just…"It’s okay." You got older and your relationship with your parents grew more distant: it’s okay, you’ve become your own person now and it’s only natural you’d live your own life. Your kids grew up and now they’re pricks: it’s okay, they’re doing fine, it’s just part of growing up. Your husband died in the war and eight years later you’re wracked with guilt because you find yourself moving on: it’s okay, you’re coming out the other side of grief, it’s healthy and necessary to begin living again. That process of accepting change is sometimes called "wisdom" but it's really just something that happens to the wise and unwise alike as we get older. I really loved the last exchange in the film, when the father and a seemingly boorish neighbor have a shockingly casual conversation about how lonely he’s going to be now that his wife has died. This is the sort of thing I see all the time when I visit my mother in her retirement community at the beach…at a certain age even the most seismic life events are countered with a shrug and a sigh more than anything else. Your beloved wife has passed away after decades of marriage: it’s okay, she didn’t suffer and she knew she was loved by her family. Speaking of the conversation between the brother and sister, I really liked all the scenes of the siblings interacting…they seemed really true-to-life and their relationships felt lived-in. It's so rare to see adult siblings interacting realistically in media; they’re either too caustic or too forgiving or too (non-romantically) flirtatious to really feel like a lifelong relationship. There are some scenes in this movie that will stay with me for a really long time: Noriko lying awake as her mother-in-law cries in the dark; the over-the-shoulder look of panic on the youngest son's face as he's taking off his shoes; how his siblings close their eyes and bow their heads when he takes the cloth off his mother’s face. Was anyone else surprised by the structure? When the parents left Tokyo with almost an hour remaining, I didn’t know where the film was going to go…I was sure the story of the film was going to be the story of their visit. If you were curious: Onomichi is 377 miles from Tokyo. For you west coast people, that’s almost exactly LA to San Francisco. For those of us back east, it’s roughly NYC to Richmond, Virginia. I don’t feel super-comfortable making a pronouncement like this as though it were the filmmaker’s explicit goal, but it might be worth noting that Onomichi, the representation of an older Japan that the younger generation is trying to escape in Tokyo and Kyoto, is in Hiroshima. And to ob1quixote’s point that the film represents a clash between the modern and the traditional, I really liked how the first conversation in the film is these two older Japanese parents in traditional garb in a very tradtional house…loading their Thermos and looking for an air pillow. The father’s observation that some grandparents seem to like their grandchildren more than their children reminds me of Borscht Belt comedian Sam Levenson's joke: "The reason grandparents and grandchildren get along so well is that they have a common enemy." The story of course reminded me of Flannery O’Connor’s "Everything That Rises Must Converge," but it also reminded me of 2005’s Junebug, where a son and his wife go to visit his parents in exurban North Carolina. Highly recommended, especially if you're from the area. I’m not sure what image the IMDB is using up above, but I really like this Criterion cover, which captures the tone a lot better than a close up of a single tear. "Now that we've seen you, you don't have to come see us, even if one of us dies." The language of mothers is universal. Usually when I see a great film I feel bad that I waited so long to watch it, but in this case that’s not true. I’m really glad I saw this at 41 instead of, like, 25. I'm sorry this comment is so long—I'm of the opinion that in discussions like this too much signal is a form of noise—and I hope it doesn't stifle the conversation. I just really loved this movie and, obviously, had a lot to say about it. I've always thought of Ozu as being pretty much the opposite end of the spectrum as kabuki. Anime, now. Anime is kabuki influenced. Ozu's movies [The Story of] Floating Weeds centers around a kabuki troupe, and the contrast between Ozu's quiet, restrained style and the over the top acting in their show really highlights how different the approaches are, I thought. But Ozu is a complex filmmaker, and it's probably simplistic for me to frame his approach as being a reactionary opposite of anything. He was much more nuanced and articulate than that. I have just rewatched the opening scene a couple of times, and it strikes me what an effective sort of calibration or something it is, with all these signals that you're in Ozu's world now. The low camera angles and the layered framing, looking through rectangles inside rectangles, with layers of life passing through each, like the neighbor woman in the window. (Kogonada's Passageways supercut highlights Ozu's signature framing beautifully.) The restrained interactions through placating smiles, the restrained politeness of Ozu's characters that Setsuko Hara did so flawlessly. And the missing cushion. Most traditional narratives prime you to expect this to be some sort of thing. To lead to some sort of overt action. Recriminations, a plot point, some sort of explicit anchoring theme. But it leads to "Oh, here it is." This is a story about people's lives. It's not a movie world where everything ties together neatly, progressing through plot points to reach a single conclusion. It's a quiet, poetic film about quiet, complex lives, and it honors the things that make up those lives, rather than simply preferencing some external narrative. It's about people and their lives. The narrative is in the service of the characters and their lives, rather than the other way around. Aaaaand, I just watched this movie a month or two ago, so I wasn't planning on rewatching the whole thing right now, but I just now changed my mind. I am going to go watch it again in a minute here, and then I'll probably want to come back and say more stuff. Despite taking a few years of the Japanese language, what I know about older-than-me Japanese cinema wouldn't fill much even if Rashomon had a couple other viewpoints and Godzilla had even more sequels; I'm saying that I don't know much about Ozu at all, so maybe I'm probably going to say a lot of stuff that has been said elsewhere for many years, but I don't care. I really loved a lot about this. I found the way the conversations were usually shot with the 180 degrees back and forth oft-putting at first but I love what it did. It really made the conversations stick out as performative and reminded you subtlely that these people were talking to each other but not really talking to each other about anything meaningful at most times. There are moments when you see more of the conversations from a wider shot (as the men get drunker and drunker), I believe this also happens a few times when Shukichi and Tomi are talking alone (like on the wall when they are at Atami), and definitely the night when Tomi stays with Noriko. Those are also the moments that feel the warmest and also, in a way, the most dangerous. For all the simplicity of the script itself, which made me feel at first that the 'screenplay' was paper thin and that what was there on screen was all about the direction and acting, the more I think about it, the more I'm impressed. First, there are so many little things that are nail the relationships. The packing and unpacking, the missing cushion and how Shukichi finding it eventually and Tomi just sort of letting it go tells you tons about their relationship. Similarly, when the sister Shige shows up at Koichi's house when the parents first arrive, she makes a big deal about the crackers she brought; Noriko shows up later and also brings something but says nothing and just gives it to Koichi's wife. Overall, the structure of the "simple" story impressed me too. Like Ian A.T., I thought it was just going to be "here they are in the city", but instead, it unfolds so that we see them staying with each of their children individually from eldest to youngest. It doesn't happen directly so it doesn't feel super obvious, but it's basically a classic 'journey' structure used to comment on the entire family. And once you start thinking about this structure, it makes the point where point where Noriko stands in for their decesed middle son that much more poignant since it's the same time Shukuici goes out drinking. And man, there is so much important stuff happening with the alcohol. Tokyo Story is "the story if an aging couple who travel to Tokyo to visit their grown children" and though you really feel for them when their own children seem cold and uncaring, by the end, you can also read it as "the story of a father who drank to much and his wife who enabled him and how it made their relationship with their adult children strained" which makes me re-examine a lot of the judgements I made before. This is especially true in all the stuff with Noriko and Tomi when Tomi seems almost insistent to point out that Noriko's relationship with her dead son maybe wasn't as perfect as she remembers. I'm never quite sure if it's something her dead son actually did or if Tomi was filtering that through her own experiences. One more thing that I loved: it tells a story that feels very timeless and familiar with regards to family and growing older and death. But there is also so much of it that could only be true in Japan in 1953 and no other time and place than that moment. I feel like I learned more about post-war Japan than if I'd read a 300 page book on the subject. I actually read someone complaining about that exact image in a review of the BluRay release of the Criterion cover. (The image you like - which I also prefer - is from that. The one that IMDB uses is from Criterion's first release apparently. I hadn't been aware of that while watching but now that you say it I think that contributes significantly to the realism of the film. It sets an expectation of life over theater that I liked. I really loved the structure. It felt like a series of connected vignettes, although it's really more of a linear narrative, but that narrative is told with anecdotes, which again, felt life-like. The low camera angles and the layered framing, looking through rectangles inside rectangles, with layers of life passing through each, like the neighbor woman in the window. I was struck by the interior shots that highlighted the geometry, and remembered noticing that when I watched Early Summer and and Late Spring. I felt that Love is Strange owed a little debt to the scene where the parents have nowhere to stay, and have to split up for the night, and to the interaction with their grown children more generally. And I was also thinking about the book An Artist of the Floating World which also takes place in postwar Japan but is more explicitly dealing with the repercussions of the war on the aging generation. I felt like I was probably missing some of the subtler parts of what the war meant in this movie, as surely it was a character or a looming part of the background. Great film, thanks for kicking off this club right! I kept getting interrupted yesterday (oddly, with calls from my family, mostly), so I ended up pausing it probably four or five times, so the picture would be frozen on some random scene and I'd think, "Wow. That is such a nice shot!" and sit there looking at it for a while. By probably the third time, I finally realized that it wasn't noteworthy. It's just so carefully composed that you could print out almost any still shot and hang it on a wall. I don't know the terminology for these things, but some were big, wide, empty shots of the sky or of organic figures, some were those layered rectangles with varying degrees of clutter, with that sort of deep focus so you could see the action going on in the background. When they're touring Tokyo, you see a lot of the cityscape through the bus window, like a moving cityscape that has been mounted and framed. As long as I was paused anyway, too, I was coming back to see what you guys were talking about, which was really great, because I noticed a bunch of things I probably wouldn't have noticed on my own. Except that latkes' comments came after I watched it, so now I have to watch again because I didn't even (consciously) notice how the ambient sounds contributed to the mood. But it seems like every aspect of the movie was like that. For such a simple story, it has so many layers you could write volumes about just about any discrete aspect. The subtle little gestures, the almost indistinguishable, elegant way the backstory is implied without launching into one of those awkward devices where characters explain things to each other for the benefit of the audience, the complicated family dynamics slowly revealing themselves. I really started to appreciate Shige's slow reveal, too. She comes off as pretty insufferable early on, petty and passive aggressive and selfish. And she is, but her dynamics reveal themselves pretty slowly. In the scene where her dad shows up drunk (Was he the greatest actor ever, or did he actually get blackout drunk for that? ), she devolves into a full-on petulant whine, making that nasally "Nyaaaaah" sound, like this is it. This is getting down to the bone for her. And that made me pay a little closer attention to Noriko's character, too. Toward the end, when she's deflecting some of the praise, maybe she's not just being humble. Maybe she's not a saint, either. This really was a great choice. A question for the Ozuphiles: I noticed that sometimes the actors looked just slightly off-of-center, as though they're not looking at the lens but at the camera casing. Was this an intentional move on Ozu's part (like the subtle way Demme has characters not look directly into camera at different points in the first Starling / Lecter scene) or was this the actors trying to look into the camera and not quite hitting the mark? I definitely agree that you come to love it as the movie goes on. When I was younger and saw my first Ozu film, at first I was so pompous I wondered if it was the director just didn't know you're not supposed to do that. But by the end it felt so poignant and subtle that I can't imagine his films without these deliberate "monologues with witnesses." I've always thought of Ozu as being pretty much the opposite end of the spectrum as kabuki. Anime, now. Yes! I think one of the reasons this film was so effective for me was that I kept waiting for it to become melodrama, and it never did. Part of it was that, well, that's what dramas from the 50s did more often than not, but also I think part of it is that my history with anime means I've come to expect conversations in Japanese to eventually involve passionate declaiming. Psst...there's an Easter egg in the tags for Ozu fans. The framing here is amazing: in the background, a man bitterly complaining about his living son; in the middle, a man who lost a son in the war; and in the foreground, with bowed head and closed eyes, a man who lost both his sons in the war. Yeah, I was really surprised when I read that "the script was developed [...] over a period of 103 days in a country inn in Chigasaki." Three months! But now that the movie is really starting to sink in and I'm reading some of great insights in this thread, it's starting to feel like impressive they were able to write it in ONLY three months. !!! Case in point, this is such a clever observation and something I never would have picked up on by myself. by the end, you can also read it as "the story of a father who drank to much and his wife who enabled him and how it made their relationship with their adult children strained"
Yeah, I loved the way this movie wasn't really about the father's drinking until it WAS about the father's drinking, and how naturally that progression felt. Just like how the film isn't really about the lingering effects of the war, except it's also ENTIRELY about that. Another thing I am thinking about is the sound of the boats on the water outside the parents' house. I've been thinking about that a lot too...it's so high in the mix I feel like it has to mean something, but I'm not sure quite what. I did notice that the sound seems to be associated with the father more than any other character. I think it's Japanese etiquette. From what I've read, prolonged eye contact is typically avoided, as it can be seen as rude or disrespectful. It's not uncommon to look at someone by looking at their neck or shoulder. This may explain the not-quite-directly-into-the-camera eye-line. Speaking of culture: I perceived most of the actors as moving their faces very little (that was a weirdly constructed sentence... anyway...). I wasn't clear if this was a stylized period filmmaking thing, or a Japanese cultural thing, or if I was just wrong. Two years since the last comment? I don't care! I was so happy watching this because it was so good and solid. I loved sinking my teeth into the characters (so to speak), forming opinions and insights about them, watching them navigate manners and expectations, etc. The eldest son is such a empty shell. From my own family I know that doctor is a good profession for a child who wants to isolate themselves into studying, and then be able to get a job literally anywhere away from home. Shige probably had a terrible time of things. Her father was a drunk, and she probably had to take care of things around the house a lot. She will always remember her parents as not worthy of respect; her mother as fat and silly, her father as a useless drunk. The damage is done and cannot be redeemed. She is the most ill-mannered of the children, because manners would mean respecting people she can never respect. Her job is fitting; a kind of skin-deep caretaking. Noriko is a mystery. I don't want to reduce her to the perfect widow and daughter-in-law. She is very sad. When Tomi warns her that when she gets older she will be lonely Noriko says that she won't get that old, like she doesn't plan on living. She insists that she is selfish, that she is not so good, but the audience will never know what makes her say this. And when Kyoko asks if life is about disappointment and Noriko answers, "Yes," with her same intense smile she has for everything, it was chilling and wonderful. I'll disagree with Ian A.T. -- I don't think the theme is, "It's okay." It's not really okay that these smokestacks are jabbing up into the sky belching smoke, or that this ugly train is slicing through the heart of this village. Things won't be okay, but they will continue. Cling to things, but be ready to let them go as well.